Pete Rose Bar & Grill, a partnership with the baseball icon and HIG Management, has opened on the Vegas Strip directly across the street from ARIA Resort & Casino. The 9,000-square-foot restaurant, bar and Strip-side patio is open daily for breakfast, lunch and dinner. Corporate executive chef Brian Littlejohn has designed a menu that includes an array of appetizers, salads, sandwiches, entrees and desserts, along with signature “Pete Rose Specials,” honoring the three cities that Rose played for, including Cincinnati chili on spaghetti, a classic Philly cheesesteak and a spin on poutine for the Montreal Expos, topped with brown gravy and cheese curds. The bar and dining room is filled with Rose’s baseball career memorabilia and more than 32 HD TVs tuned to sports analysis and action. Rose is a Las Vegas resident and is expected to be a regular visitor to the bar and grill. Pete Rose Bar & Grill, 3743 S Las Vegas Blvd., Las Vegas, NV 89109, 702-331-5100. Wynn Las Vegas' Costa di Mare is helmed by executive chef Mark LoRusso. (Bartolotta di Mare was renamed, and transitioned into this concept.) The restaurant offers sustainably sourced Mediterranean seafood with more than forty varieties of fresh fish and shellfish flown in daily from Italy's coastal waters. Langoustines, imperial red prawns, Venetian soft-shell crab and more are on the menu, as is LoRusso's handmade cuttlefish ink tagliatelle with shrimp, lobster and spinach. Costa di Mare offers two levels of seating along with semi-private tables surrounding an intimate lagoon. The restaurant is open nightly starting at 5:30 p.m. Costa di Mare, 3131 Las Vegas Blvd. S., Las Vegas, NV 89109, 702-770-7000, 1-888-320-WYNN. Las Vegas prides itself on having the largest and best in several categories. Now, it can lay claim to the world’s largest Hooters. Now open at the Palms Casino Resort, the split-level venue is located partially inside on the casino floor, as well as outside at the pool. The 15,200-square-foot space seats 420 guests and is framed by a giant owl at the entrance. Inside are 50 TVs, booth seating and tables with high-back chairs. The menu contains the "breastaurant’s" signature wings, plus burgers, sandwiches, fish tacos, snow crab legs, salads and desserts like chocolate mousse cake. Hooters is open daily for lunch and dinner and late-night. Hooters, 4321 W. Flamingo Rd., Las Vegas, NV 89103, 702-942-7777, 866-942-7777, 866-942-7770. 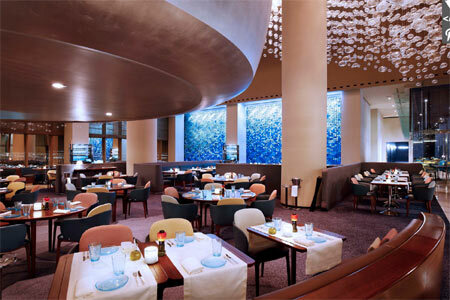 Alain Ducasse’s miX Restaurant at Delano Las Vegas has become Rivea, a Mediterranean-inspired restaurant by chef Ducasse. He currently has two Rivea restaurants, one in the Hotel Byblos Saint Tropez and one at the Bulgari Hotel in London. Rivea, Delano Las Vegas, 3940 Las Vegas Blvd. S., Las Vegas, NV 89119, 877-632-5400. To celebrate its 30th anniversary, Ferraro’s Italian Restaurant & Wine Bar is offering a four-course menu at a special anniversary price of $30.30, featuring classics from its original menu. The menu will be available November 6-8 and November 13-15, and will include a choice of appetizer, salad, entrée and a dessert sampler. There are seven appetizers to choose from, such as calamari fritti and Nonna’s stuffed pepper; and 11 entrées, like veal marsala, eggplant parmigiana and osso bucco. Ferraro’s Italian Restaurant & Wine Bar, 4480 Paradise Rd., Las Vegas, NV 89169, 702-364-5300. For the first time, Andre’s Monte Carlo is offering a five-course tasting experience that is served on one plate. Priced at $50, the chef’s tasting plate includes an unscripted selection of three hot or cold appetizers, one entrée and one dessert item. Each is selected by executive chef Christopher Bulen, allowing guests to experience five small versions of courses. Andre's Monte Carlo, Monte Carlo Resort & Casino, 3770 Las Vegas Blvd. S., Las Vegas, NV 89109, 702-798-7151. CRUSH eat, drink, love at MGM Grand is jumping into the football season with a special menu and pricing offered exclusively during NFL games every Sunday and Monday. Prepared by corporate executive chef Billy DeMarco, the selections include $12 short rib sliders made with pickles and Carolina slaw; $11 sausage hoagies with sweet peppers and balsamic onions; $11 grilled chipotle barbecue chicken wings; and $10 fresh ricotta and Nueske’s bacon calzone. In addition, domestic beer pitchers are priced at $19.99. CRUSH eat, drink, love, MGM Grand Hotel & Casino, 3799 Las Vegas Blvd. S., Las Vegas, NV 89109, 702-891-3222. Wynn Las Vegas has announced three chef appointments. Rene Lenger has taken over as executive chef of The Country Club, replacing Carlos Guía. Lenger has been at Wynn Las Vegas since 2007, holding positions at The Country Club, Switch Steakhouse and Lakeside. David Middleton has been named the executive chef of Tableau and is returning to the Wynn. He previously worked alongside chefs Paul Zlatos, Devin Hashimoto and Alex Stratta during his five years at Alex, before leaving to open Scarpetta as executive sous chef and serving as executive chef at Marche Bacchus and Daniel Boulud’s DB Brasserie. Paul Zlatos will become assistant executive chef at Lakeside under executive chef David Walzog; the duo reunites after opening the restaurant together in 2010. Since 2010, Zlatos has served as Oprah Winfrey’s personal chef, executive chef at Sirio at Aria and, most recently, executive chef of Tableau. Wynn Las Vegas, 3131 Las Vegas Blvd. S., Las Vegas, NV 89109, 702-770-7000, 1-888-320-WYNN. Landry’s, Inc. has announced Jose Navarro as the new executive chef of Trevi at The Forum Shops at Caesars Palace. Previously, Navarro has held several positions in Las Vegas. Navarro served as executive chef at The Grotto at the Golden Nugget, played a key role in the opening of SHe by Morton’s and was executive chef at Beso Steakhouse, two former CityCenter restaurants in partnership with Landry’s, Inc. and Eva Longoria. He was also executive chef of d.vino Italian Food & Wine Bar at Monte Carlo and spent time at Morels French Steakhouse & Bistro at The Palazzo and Barolotta Ristorante di Mare at Wynn Las Vegas. Trevi, Caesars Palace, Forum Shops at Caesars, 3500 Las Vegas Blvd. S., Las Vegas, NV 89109, 702-735-4663. The Buffet at Wynn is temporarily closed for renovation through November 22, 2015. The Buffet at Wynn, Wynn Las Vegas, 3131 Las Vegas Blvd. S., Las Vegas, NV 89109, 702-770-3340, 888-320-WYNN.